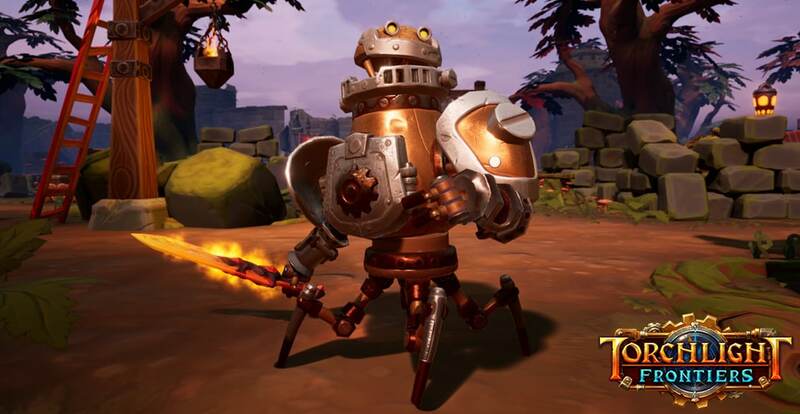 A big part of Torchlight: Frontiers is collecting an ever wider variety of power for your character. Today we’re going to show how Relic Weapons add another dimension to character building, beyond class skills and gear based stats. Unique item that levels up. Gains increased stats, new affixes, and can grant access to unique skills. Equipped in the dedicated Relic Weapon slot of your character. Can be activated to swap out your primary weapon for a short time, granting additional powers and effect while active. Designed to provide a wide range of options for character building - they can be build-defining items or used to compliment a preferred play style. Earned through crafting, so you can reliably work towards the Relics you want to collect. Basically gives your character super powers. Looking at this tooltip should give you a quick idea what a Relic is before we dive into specifics. Relics gain XP as you kill monsters. As they level up their stat power increases, and at milestone levels you unlock new powers. Let’s look at some different weapons to illustrate the kinds of gameplay Relics open up. Here’s Bane, a Relic players might acquire in earlier parts of the game. At Level 7, Grants Passive Skill Contagion: Damaging a poisoned enemy has a chance to release projectiles that damage enemies and inflict Poisoned status. As long as Bane is equipped in the Relic Weapon slot, the Contagion passive can be used. This means you can benefit from the Contagion proc even when Bane is not activated. Bane is powerful on its own when used for the weapon attacks, but if players build a character to take advantage of Contagion they’ll reap even more benefit. This is Fire Striker, a Relic which leans into its activated state. 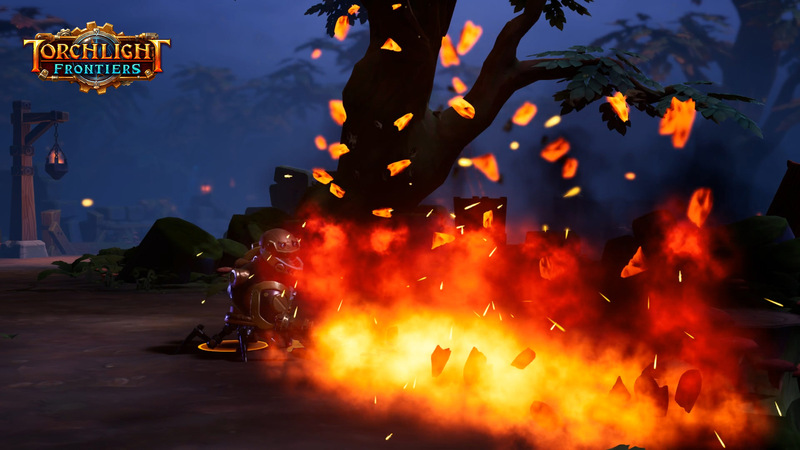 At Level 5, Gains Affix: Attacking with Fire Striker unleashes a wave of fireballs. These have a high chance to inflict Burning. Fire Striker is all about waving your flaming sword around during activation, setting as many enemies on fire as you can before the duration runs out. The bonus critical and attack speed affixes, once fully leveled up, really make this a spike damage machine. Finally, feast your eyes on Flaming Destroyer. At Level 3, Grants Active Skill Sword Smash: Summon an ethereal sword that slams into enemies, dealing direct damage and leaving them Burning for 125% weapon damage. At Level 5, Gains Affix: Gain 5% attack speed when you hit with this Relic. Stacks up to 5 times. 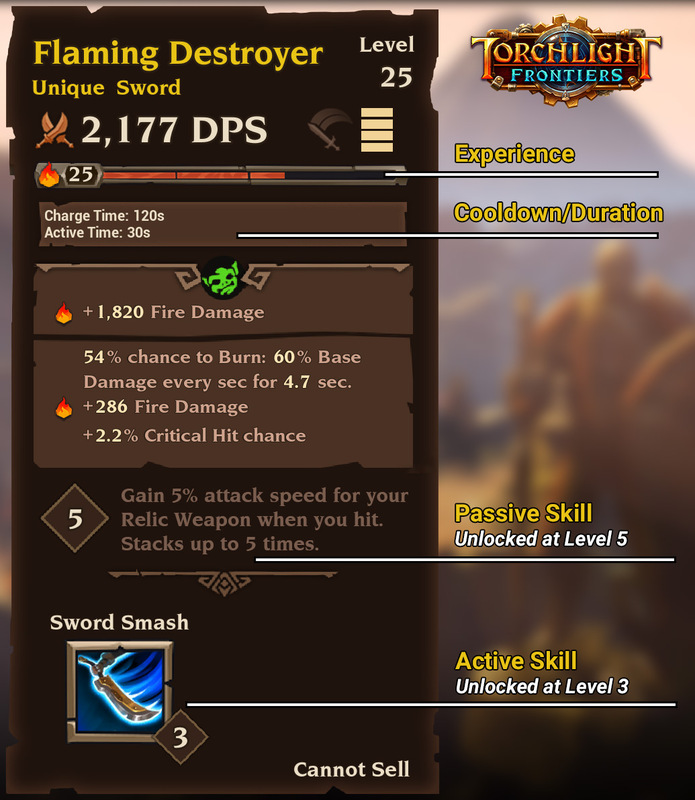 Sword Smash is an active skill that can be placed in the skill bar as long as Flaming Destroyer is equipped. This means you can build a character that uses this skill as part of their core rotation. The stacking attack speed affix gives this weapon a wicked power spike during activation as well. Relic Weapons are all about widening the options players have to build their character. Each Relic has different stats and powers it can grant the character, and since they’re items you can collect, they provide a way to customize your build to different content and roles. Since most weapon types (staff, sword, etc) can be used by all classes, collecting Relic weapons ultimately builds a library of tools that any of your characters can choose to build with. Relic activation has a dedicated slot on the skill bar (default W). Relics currently have a duration of 30 seconds when activated. During that time your primary weapons are swapped out for the Relic weapon. In this state, your skill damage and weapon attacks use the Relic weapon’s stats, including any bonus affixes or procs on the Relic. Activation also triggers an AoE buff for you and your party members. The type and strength of the buff depends on the Relic. We hope to see parties strategically planning what Relics to bring on a mission, and timing when they trigger activation buffs. Once the active duration ends your primary weapons are returned to your hands and the Relic needs to charge before it can be used again. Currently the charge time is 120 seconds. We are working on gear affixes that affect charge time, duration, and other aspects of the Relic weapon mechanics. These will give more ways for players to customize how their Relics fit into their overall character build. In the Fort, players construct a Reliquary which they’ll use for crafting, empowering, and storing their Relic collection. Relics aren’t item drops - they are ancient artifacts of power you hunt down and restore to glory. Forging a Relic requires some of the general purpose crafting materials found in the world, and a Relic Core item unique to each Relic. Drop rates are fairly predictable for the materials and cores. Players are not meant to depend on ultra rare RNG-based drops to determine whether they can earn a Relic. It’s about being able to reach the right area and defeat the monsters guarding those precious resources. We see this as a wide open space to think of crazy mechanics and skills a character could have, and insert that gameplay in a way that players can combine with classes and builds in new and fun ways. There are also certain play styles that fit poorly into core class designs, like dedicated tank or healer kits, which we can explore by creating Relics that focus on those mechanics. Each class then gets a chance to play with this subset of skills and traits. Relics are another feature that enables horizontal growth for the game. Adding these items & powers periodically will expand the content that players have available, creating new niches for builds & play styles. Today we’ve shown some very cool, powerful, but relatively straight-forward Relic weapons. I can’t wait to continue showing you more awesome Relics the team has been building! Suzie Ford over at mmorpg.com spent some time talking to Tyler about Relics recently and wrote up her impressions on the feature. Check it out for another take on Relics!